Belgian underwater repair specialist Hydrex recently utilised its mobile drydock system, mobdock, to facilitate the installation of a combined echo sounder and speed log system on a ro-ro vessel in just one day. As the job was undertaken during a scheduled port stay in Eemshaven in the Netherlands, the vessel was not subject to any unexpected delays. The job began with an inspection, by Hydrex technicians, of the vessel’s tank and shell plating, which was to host the equipment. By drilling a minor hole in the plating, the required location of the equipment became discernible on the exterior hull. Following this, the mobdock was constructed and installed over the area, replicating drydock working conditions inside the tank and preventing water ingress. To facilitate improved access, a section of frame was removed. Next, the edges of the opening were prepared and the echo sounder base flange was positioned correctly. 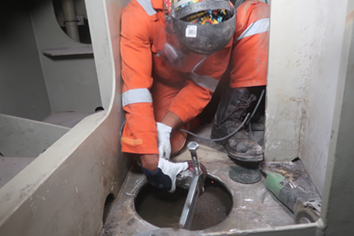 A full penetration weld was then performed to secure the unit, and the weld seams were successfully NDT-tested by an independent inspector. Finally, the system valve was fitted atop the flange, and the mobdock was detached. Where a mobdock is not required or not suitable, Hydrex can instead undertake underwater welding. The technique was required recently as part of a temporary repair to a drill ship in Dakar, which suffered damage after a transit flap came loose. A team of Hydrex divers wet-welded six prefabricated doubler plates onto the damaged areas of the vessel, with one plugging a leak in the vessel’s ballast tank. This ensured the vessel was watertight and able to operate until a permanent repair could be arranged.